Yet another massaged kale salad! 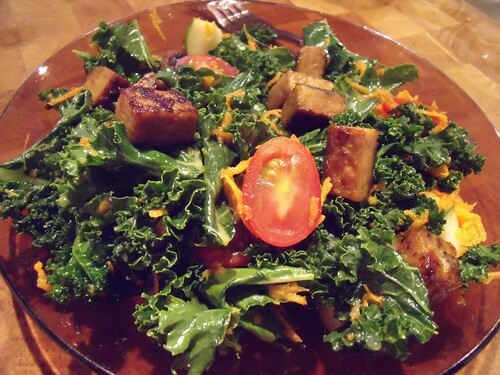 We can’t stop with the kale around here, and this kale salad with tempeh is a great new addition to the repertoire. Tempeh (fermented soybeans) is a great way to get some extra protein in, much like omnivores tend to throw grilled chicken or fish onto their salads, I do tempeh or cooked beans. And this orange/chipotle marinade is super easy and super delicious. Feel free to adjust the amount of chipotle to taste. I will be doing this again soon for sure. I also think a bit of avocado could be wonderful here. Go forth and experiment! In a large bowl, toss kale with olive oil, sea salt, and orange zest, and massage with your hands for a couple of minutes. Leave to sit for 10 minutes. Meanwhile, combine orange juice and chipotle, and toss tempeh in marinade. In a pan over medium heat, stirfry tempeh and orange juice/chipotle marinade until the sauce has been absorbed and the tempeh is cooked through. Add carrots, tomatoes, and cucumber to kale. Throw cooked tempeh on top. Combine mustard and apple cider vinegar, and toss with salad just before serving. 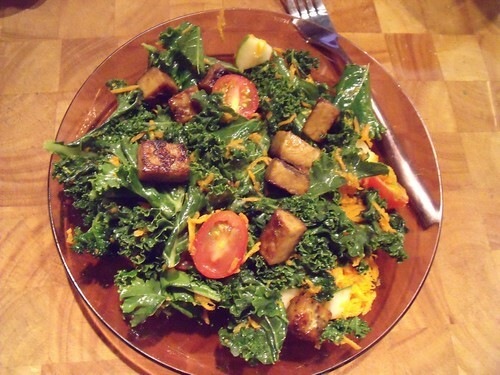 Wanna Try More Tempeh or Kale Recipes? How about a Tempeh Avocado Sandwich with a Kale Salad? Or maybe Kale & Queso Fresco Soft Tacos are calling to you? Or browse the Kitchen Operas Kale Archives. Mmmm, kale. ← 100 Posts at Kitchen Operas — A Celebration! I’m trying to get re-acquainted with the taste of tempeh, and the fact this has chipotle really appeals to me.